Journey of the Magi is a fresco created by Benozzo Gozzoli, who was born in Florence Italy in 1420. This typical Florentine painter was schooled as a goldsmith and worked on the famous bronze Gates of Paradise together with Lorenzo Ghiberti. 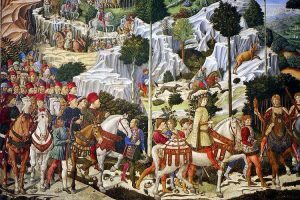 The Journey of the Magi to Bethlehem was ordered by Piero di Cosimo de’ Medici (also called Piero the Gouty) and created between 1459 and 1460 as a decoration of the private chapel of the Medici family which is now called the Magi Chapel. The chapel, which is located inside the Palazzo Medici, was part of the palace and living quarters of the Medici family. In this fresco Gozzoli displayed the worshiping of the three magi, the scene was spread out over three walls. The fresco does not really represent what the Florentines thought the Three Wise Men looked like, the fresco portrays a great amount of anecdotes and characters from the Medici family, emperor John VIII Palaiologos and Emperor Sigismund of Luxemburg. These men are parading through Tuscany in the guise of the Three Wise Men and arriving in Florence for the important occasion of the Council of Florence, which was held between 1438 and 1439. The reason the Medici family wanted this event portrayed was the fact that they managed to make peace between the Catholic Church and the Byzantine Church, which was a huge accomplishment, worthy of a fresco in one of the most important rooms of their palace. The Council was originally scheduled in Ferrara, it was only thanks to Cosimo de Medici (Piero’s father) if it was moved to Florence. This event was not only important to grow the popularity of the House of Medici, but also because it was a way to exchange knowledge with the refined Byzantine culture. The Renaissance was just starting and the Council of Florence gave it a very important push. Some years later, after the fall of Constantinople, many of the scholars at the court of the Byzantine Empire escaped to Florence, remembering the warm welcome they had received the first time. This was a very important factor in the development of the Renaissance. Gozzoli portrayed the richness of the Tuscany landscape in which the young Caspar is leading the group on a white horse. There is some controversy about this young wise man being Lorenzo the Magnificent de’ Medici. Following the young wise man is Piero the Gouty, also on a white horse, who was head of the Medici family at the time of the creation of the fresco. Following the two is devout family founder Cosimo de Medici on a humble donkey. Then come Sigismondo Pandolfo Malatesta, lord of Rimini, and Galeazzo Maria Sforza, lord of Milan. These two lords did not actually have a seat in the council but they where present in Florence at the time the fresco was created and where important to the Medici family so they are included. They are in turn followed by Florentines like the Pulci brothers, Marsilio Ficino and Benozzo Gozzoli himself, who is looking at the viewer and has a scroll on his hat. 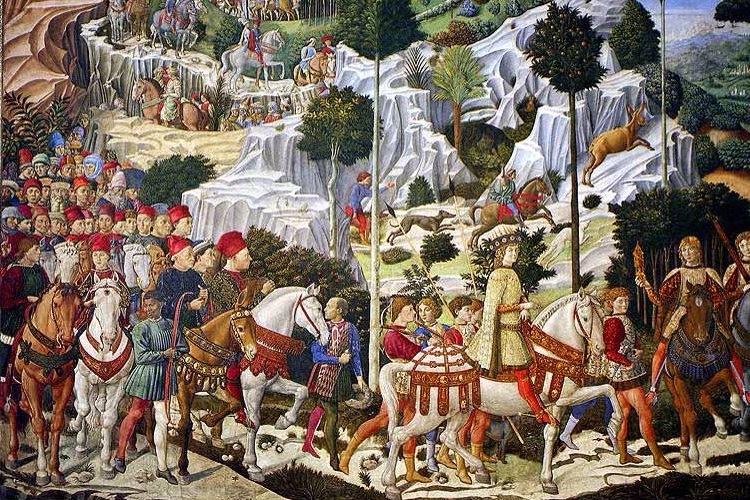 The little boy, Lorenzo il Magnifico, who some believe is seated on the first white horse, can be seen below Benozzo Gozzoli, next to Lorenzo we see his younger brother Giuliano. This fresco is not only beautiful but also a summary of the political, cultural and physical landscape of Florence Italy at the time of the Renaissance. Benozzo Gozzoli was a true artist and created a masterpiece that still is highly valued for its beauty and historical references. Benozzo Gozzoli was a man in the middle between the new artistic trend (Renaissance) and the traditional gothic style. The fairy landscape, and the alleged portrait of Lorenzo the Magnificent who was just 10 years old at the time reveal his legacy; at the same time, the realistic portraits of Piero de Medici, Giuliano de Medici and many more, incuding the self-portrait of the artist himself, show that Benozzo Gozzoli was sensible to the new style. A beautiful fresco shining and sparkling like a precious stone inside Palazzo Medici.